Jean-Marie Chanoine promised he wasn’t going to let his daughter fail. 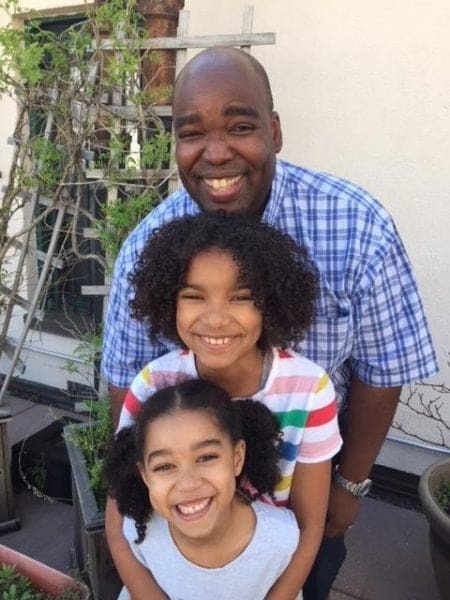 The 46-year-old tech entrepreneur, says that after watching his eldest daughter, a gifted and talented student, struggle with math, he knew something wasn’t adding up. Study after study has shown that Black children with talent are often overlooked by teachers who are identifying students for gifted programs. And the perception that Black and Latino kids lack math ability innately, is only worsened by lack of access to basic math classes in predominantly urban schools (fewer than 10 percent of students taking Algebra 1 are Black). For girls, the STEM (Science, Technology, Engineering and Math) gender gap is just as real. By the 8th grade, girls who performed better than boys in math and science, no longer keep that advantage. Chanoine refused to see either of his two daughters become statistics and literally took matters into his own hands. He created a math app game series called ARBE10—named after his two daughters’ initials—to help his daughter and other kids learn the basics. Chanoine knows the value of an education. He earned four degrees from top schools since immigrating from Haiti at 13 years old and has worked at Goldman Sachs as a trader and at multiple start-ups. Even with all of those achievements, he is committed to providing this tool to his daughters and other children, particularly students of color, worldwide. “A lot of kids fall through the cracks. They lose confidence and don’t persevere and we, as a society, end up losing a lot of talent,” he says of Black math students. Considering that math and math games have origins in ancient Africa, it’s only right that today’s kids get a shot at the best. As for his daughter, who is currently in the fourth grade, Chanoine says she has her confidence back and even his youngest, a kindergartener, has gotten in on the fun. Both girls are credited as co-founders of the ARBE10 app on it’s website. “Now, our daughter is not only back to thriving in math class again, but her confidence — and science ambitions — have been restored,” says Chanoine. Like any good fdad, he’s taking responsibility for stepping up to lead. You can find ARBE10 on Google Play and Apple’s App Store. The post Devoted dad launches app to help daughter struggling with math appeared first on theGrio.